In a conversation, there are moments when you don’t quite understand or when you can’t hear what the other person says. Most students learn “Répétez s’il vous plaît”. But this is not the right sentence for each scenario. Here are some tips on what you should say when you don’t understand or hear something in French, if you are confused, or if you need to get further information. If you don’t understand something, don’t say “répétez s’il vous plaît”, because the person will repeat exactly what s/he just said : if you didn’t get it the first time, it’s unlikely you will the second. “Répétez s’il vous plaît” is used only when you couldn’t hear the first time. Furthermore, it’s a bit too direct: it’s a order, using the Imperative mood. How many times have you actually said to someone in English “Repeat please”? This is the short version. In English, you’d say “Excuse me?”. In both languages, you’d put your hand by your ear, or turn your ear to the person as you are saying it, to reinforce the message that you couldn’t hear. You could also say “Pardon ?” (Sorry?). Je n’ai pas entendu : vous pouvez répéter s’il vous plaît ? The next option will involve a bit more speaking from your part. First, you’ll state the problem “je n’ai pas bien entendu” – I didn’t hear well, and then you may ask for the person to repeat. I would not use an Imperative mood there as in “répétez” but smooth it a bit and say “pourriez-vous répéter s’il vous plaît” – “could you repeat please”. In more casual French, we’d say “vous pouvez répéter” or use “tu” and say: “tu peux répéter “. But I would never say “répète”, it’s just too direct! And I’ll always add “s’il te/vous plaît”. Je n’ai pas entendu : pourriez-vous parler plus fort s’il vous plaît ? If your French interlocutor mutters, that’s what you need to say so they speak louder. 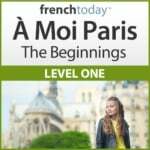 In more casual French, you can say “pouvez-vous / peux-tu parler plus fort”, or even drop the inversion : “vous pouvez / tu peux parler plus fort” then add “s’il te/vous plaît”. Here again, stay away from the Imperative mood. Here again, typical French methods will teach you “je ne comprends pas” – I don’t understand. But If you just say “Je ne comprends pas”, the French person will think you didn’t get anything at all, and is very likely to just switch to English, or give up on you. This is a very old-fashioned way of saying “I’m sorry” in French. So it’s a false friend, it looks like “I’m confused” but it doesn’t translate the same way in French! So, instead of “je ne comprends pas”, say, “Je ne comprends pas BIEN” (I don’t understand everything), causing your interlocutor to reformulate his sentence, using other words. You may also say : “je ne comprends pas tout” (I don’t understand it all), or “je pense que j’ai compris l’idée, mais pas tout les mots” (I think I got the idea, but not all the words). 6 – Asking “How do You Say X” in French ? To say “how to you say X in French”, say : “comment dit-on X en français”. You may also say: “quel est le mot français pour X ?” (what is the French word for X?). In casual French, you could also say “c’est quoi X en français ?”. 7 – Asking “What does X mean” in French ? To say “what does X mean”, say: “qu’est-ce que ça veut dire X ?“. In more casual French, we’d say “Ça veut dire quoi X ?”. 8 – How To Say “Please Speak Slower” in French ? For students of French, the main problem is often the speed of speech. French people speak really fast among themselves, and if many understand they need to slow down to help a foreigner understand better, sometimes they don’t slow down enough. So, in this case, it’s perfectly fine to say “pourriez-vous parler plus lentement” or “vous pouvez parler plus lentement” / “tu peux parler plus lentement” and then please. Je suis désolé, j’apprends le français depuis un an : je peux parler un peu, mais c’est difficile de comprendre tout. Est-ce que vous pouvez parler plus simplement s’il vous plaît? I’m sorry, I’ve been learning French for a year: I can speak a little, but it’s difficult to understand everything. Could you speak in a more simple way please? Je crois que j’ai compris, mais je ne suis pas tout à fait sûr ! I think I got it, but I’m not quite sure! Excusez-moi, je ne suis pas sûr d’avoir compris : vous voulez dire que… ? Sorry, I’m not sure I got it: you mean that… (and then you rephrase)? Lit. are you following me, meaning are you understanding me. Je n’ai pas l’impression d’être très clair. I don’t feel I am making sense. I’m lost – confused : watch out! “je suis confus” is a very old fashioned way to say “I am sorry” (je suis désolé). “C’est à dire” is quite advanced French. It means “what do you mean ?” when used as a question, or “I mean” if you are volunteering the additional info. Now, if you go to France to practice your French, choose your destination carefully : read my article on vacationing in France to practice your French. You’ll also face another challenge: how to make French people speak French to you!